It isn’t often that John and I have free days that coincide, but when that happens, we like to drive out somewhere and just get lost. Our jaunts usually have a destination, but once we get there and have done whatever it was we drove out there to do, then it’s time to just get in the car and noodle around to see what we can see. What with onboard GPS and cellphone navigation apps, it’s hard to actually “get lost,” but we try our hardest. Yesterday we drove west to the Sperryville area to visit the Copper Fox Distillery and learn about making whiskey. Neither of us drink whiskey, but we’re curious about the recent uptick in boutique distilleries in the area. 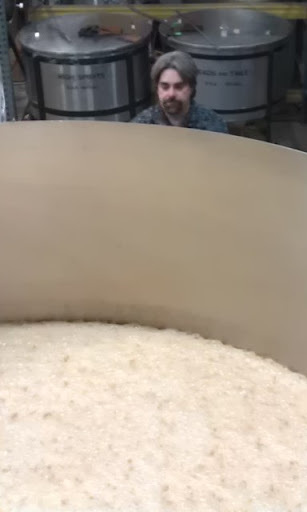 Some months back we visited Catoctin Creek Distillery and found it interesting, so we thought it might be fun to see another distillery in action. It was a beautiful day and we drove the whole way with the windows down, enjoying a taste of early autumn while Betty in the Box (our name for the onboard GPS system) gave us the directions. We got there just in time to take the distillery tour, which was free but did not include samples – which was fine because neither of us drink whiskey. We got to see big bags of barley. We got to see barley being sprouted and barley being smoked. We got to see barley fermenting in great big vats, which makes the mash that makes the whiskey and also gets fed to happy area cows, who apparently knock each other down to get to the mash when it’s delivered (we were assured that this is only because the barley mash tastes nice – the alcohol has been cooked out by the time the cows get to it. We actually tasted some of the sprouted barley and it ain’t bad). 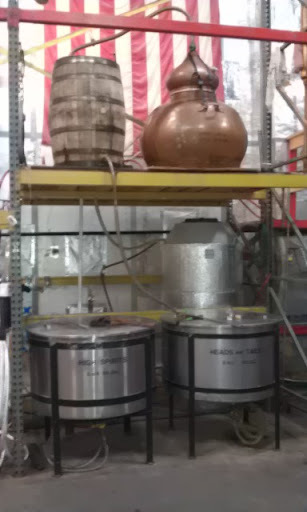 And then we got to see the distilling setup, which was not nearly as complicated as I thought it would be. We got to see the whiskey in its charred white oak barrels, sitting on shelves aging quietly except for the occasional break in routine when the distillers roll the barrels around the floor to shake things up a bit. And we got to smell but not taste the finished single malt whiskey and the rye and compare the two, which was fine because we don’t drink whiskey. And then we bought a bottle of the single malt. Don’t ask me why – we don’t drink whiskey. And then we got back in the car and looked at each other and said “let’s go noodle.” This means we’re just going to drive until we see something that interests us enough to stop, and it’s my favorite part of our little jaunts. This time, however, we were also looking for a place to eat dinner. We bypassed a couple of likely-looking spots in Sperryville because John had a hankering for barbeque. We drove south past Culpeper and saw a small-town parking lot flea market where someone was serving barbeque from a truck, but we passed that, too. We noodled further south to Mineral but didn’t find anyplace that looked exciting, so I did a little cellphone survey and found a ‘que place back in Culpeper that got high marks on Yelp. 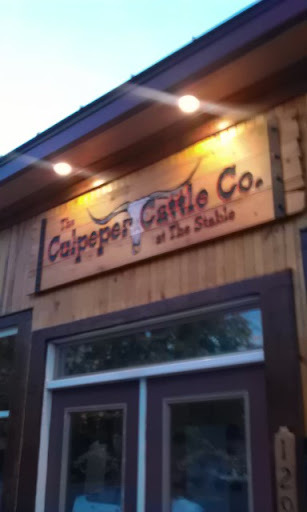 It seemed a wee bit pricey for ‘que, but we were hungry so we plugged the address of The Culpeper Cattle Company into Betty and pointed our nose north once more. Culpeper is one of those towns that has a couple of refurbished historic blocks in its downtown area featuring shops and restaurants with names like It’s About Thyme and Green Roost and Hazel River Inn and Miss Minerva’s Tea Room & Gifts, and we figured a ‘que place with a name like Culpeper Cattle Company and three dollar-bill signs on its Yelp reviews (meaning “Pricey”) would be located in this district. We weren’t wrong, and the signage on the restaurant, with added “at the Stable” language (which gave it an even more gentrified sound, sort of like like Stratford-upon-Avon) was in keeping with the overall appearance of the area. There was an outside deck that seemed pretty busy, so we opted to go inside and check with the host/hostess to see if there was a wait. When we stepped inside, we discovered that the fancy sign is as fancy as this place gets. The dining area was small – only eleven tables (mostly booths) – and the kitchen/service area opened right onto it. I suppose we looked confused; someone in a booth hollered, “Sit anywhere!” and so we did – at the only available table, which was dead in the middle of the only path to the kitchen. We were greeted almost immediately by a kinda-punky, kinda-pregnant but very self-assured young server who gave us menus and brought us a drink orders: two diet cokes. We acquainted ourselves with the menu and had a look around. I was a wee bit startled to see that there was apparently no place for the waitstaff to put their personal belongings – purses were stowed between the soft drink fountain and the only two-person table in the place, which was occupied by a biker-y looking dude. He seemed right at home, though – he got up a couple of times to refill his own drink and actually disappeared from the restaurant for about 15 minutes, but he also assured us that the food was good. I ordered a brisket and sausage sandwich with a side of collard greens; John asked for a half-rack platter, and we settled back to wait for our food. I was thirsty so I’d already sucked down most of my diet, and it was about that time that I noticed the waitstaff struggling with the soda dispenser. Turns out that our two drinks had drained the Diet Coke fountain dry, and there was NO MORE DIET COKE. Our waitress offered to sub some other beverage, so I asked for an unsweetened iced tea and John decided to have a beer and a glass of water. The beer and the tea and the glass of water were duly fetched, but within moments the staff determined that there was also NO MORE UNSWEETENED ICED TEA – that mine was, in fact, the last of it. Our waitress told us she would have to make some more. She was so dry and unembarrassed about the situation that I had to laugh. About fifteen minutes passed and here came our waitress again, and something in her expression told me she had more news for us. Actually, the news was for John – she clapped him on the shoulder and told him the ribs were still in the smoker and WOULD NOT BE READY FOR ANOTHER FIFTEEN MINUTES. He looked nonplussed; the waitress shrugged; I howled with laughter, so much that everyone else in the restaurant peered over at us. Most of the other patrons merely looked amused, but a woman in a nearby booth began to study us. I told the waitress not to wait my order; I was starving. Off the waitress trotted; over came the woman from the booth, who informed us that she was SURE she knew us from somewhere and were we from Culpeper. 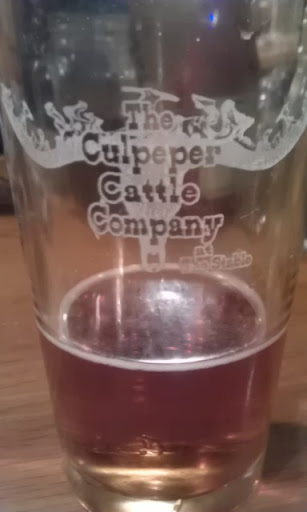 We said no, we were from the DC area and were rarely in the Culpeper vicinity. 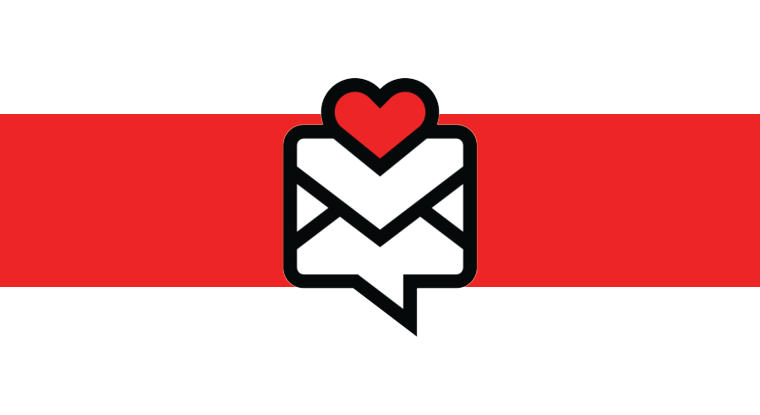 She repeated that she KNEW US FROM SOMEWHERE and that she NEVER FORGETS A FACE and then, barely modulating her voice, told us she was with the Virginia State Troopers and had we EVER BEEN PULLED OVER BY HER? We had to inform her that no, we’d never been pulled over by her or any other State Trooper in the area; so sorry. I made a joke about Bonnie and Clyde but it didn’t go over terribly well and the woman’s smile became a little fixed as she retired to her booth, still giving us strange looks. I was chewing on my lip to keep from laughing and eventually the woman and her companion left, but not without stopping again to tell us she was SURE SHE KNEW US and IT WOULD COME TO HER EVENTUALLY. We’d been waiting for another fifteen minutes before my food arrived and I have to confess it was a grave disappointment. The collard greens were completely unseasoned – not even salted – although they tasted very fresh. There was no hot sauce or vinegar on the table but there were two squirt bottles of barbeque sauce on the table so I squirted a dollop of sauce from one of them into the greens, which at least gave them a little flavor. My sandwich came with something advertised on the menu as “fresh cut seasoned potato chips,” and they were kind of thick cut and snappy when you bit into them but without any flavor beyond a faint and rather odd sweetness. John and I decided to try the hot sauces on the potato chips to see which one we liked better, but as nearly as we could tell both bottles contained the identical sauce, which was sort of sweet and sort of hot but really not much of either. The first bite of my sausage and brisket sandwich was flavorful, though – the sausage was nice and spicy, the brisket tender and the cole slaw topping it was tasty and fresh. The brisket could have used a rub or something, though – if the sandwich hadn’t contained the spicy sausage, it would have been pretty darned dull. Right about then one of the servers came in with two two-liter bottles of Diet Coke, and our waitress dryly informed us that she loved us enough to send out for Diet Coke. So mad props to her for that. John’s platter of ribs showed up shortly after. It was served up with corn on the cob and a piece of cornbread, as well as the two sides he ordered with it: french fries and slaw. I sampled the fries; they were quite good. John liked the corn, but when I tried the cornbread it was nearly inedible – hard and flavorless and stick-in-the-throat dry. The waitress offered butter to go with the cornbread, but it would have taken a LOT of butter to soften that cornbread up enough to eat it. We passed. John’s ribs, while very nicely cooked, were also without flavor except for the thin coating of barbeque sauce they’d been slathered with prior to serving. Someone in the kitchen needed to get acquainted with the salt and pepper shakers, at least. So the food was kind of a bust, but our waitress and the clientele were entertaining enough to make up for it. We even got a senior discount and a free cookie, which took some of the sting out of the bill. We tipped our waitress 25%, which seemed to surprise her Not At All. I had to admit it: she had blasé down to a fine art. Would we go there again? Probably not, but if you add in the entertainment value, it wasn’t a bad way to end a day of Getting Lost.